First off, we would like to give huge props and kudos to Techdirt for leading the charge against SOPA. Their daily coverage of this dreadful piece of legislation has been spectacular. We have provided links to some of the top stories of the week regarding SOPA, but visit their site for more in depth coverage and analysis. SOPA Opera: Where Do Your Members of Congress Stand on SOPA and PIPA? 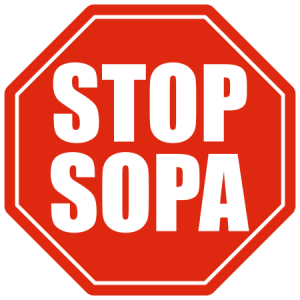 Also check out our initial blog post regarding the fight against SOPA. We link to other educational resources and to EFF’s Action Page. Keep the pressure up, and if you haven’t contacted your representatives, please make it a point to do so this week!